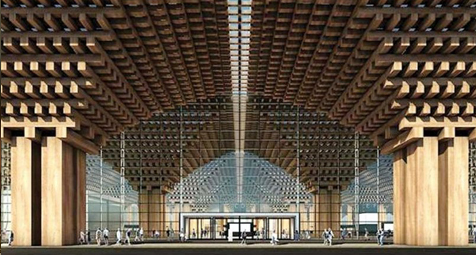 MASSIVE WOODEN structures featured prominently in the winning design for Suvarnabhumi Airport’s new passenger terminal could pose a fire risk and might violate construction laws, the Engineering Institute of Thailand (EIT) said yesterday. It gave Airports of Thailand Plc (AoT) the warning after engineers and citizens questioned the security of Terminal 2 (T2) on social media. EIT vice president Kecha Thirakome said the design includes modular structures in multiple layers that, in case of a fire, could allow flames to spread fast. The “forest” design for the Bt35-billion passenger terminal by renowned architect Duangrit Bunnag and a consortium called DBALP won the nod from an AoT judging panel last month. The decision was immediately controversial, first facing claims that it plagiarised Kengo Kuma’s plans for the Yusuhara Wooden Bridge Museum in Japan. Meanwhile, another design consortium, SA Group, bidding for the job threatened a legal challenge after it was disqualified on a technicality. Kecha noted that Thailand adheres to US National Fire Protection Association standards, which ban the use of wood in public buildings such as airport terminals because it’s so combustible. “If this massive wooden structure is allowed, it would violate national construction laws,” he said. Assistant Professor Chuchai Sujivorakul concurred that only safe materials like concrete, stone and ceramic should be used, and they are relatively easily to maintain as well. “This terminal should upgrade our airport to ‘4.0’ standards with digital technology including IoT, Big Data and artificial intelligence,” added Associate Professor Anek Siripanichakorn. “We should also be concerned about safety and sustainability, as well as saving energy. ”Neither the EIT nor the Architects Council of Thailand was involved in the design contest. Both have suggested AoT review the design in detail and, if a fresh competition is deemed necessary, include them in setting the terms of reference. AoT has yet to sign a contract with Duangrit and his team pending consultation with experts and the public. It does not matter where these mass timber buildings start popping up around the world they should all be fire protected to defend the carbon storage in lumber because fire would only release what Mother Nature did to collect and store the carbon in the wood. The other thing we need to consider when we think of building with our renewable sustainable lumber is we have to consider lowering the risk management premiums by overcoming the negative perception of fire in wood structures. Today Climate Change threaths are having a major impact on insurance premiums so anything we can do to lower risk helps our builders use more renewable sustainable products like mass timber. M-Fire is a major supporter of mass timber CLT buildings that add fire protection to help make these buildings more cost affective.